The 2019 Light Festival is set to take place in Ho Chi Minh City between May 5-19. PSNews - Le Te Xa Tac (or Xa Tac Worship Ceremony) was held in Thua Thien Hue Province on March 13 to pray for for peace and good harvest. A collection of 105 art works by 102 women artists are on display at the HCM City Fine Arts Association. With a coastline of more than 380km and numerous bays, lagoons, islands and golden sandy beaches, Khanh Hoa has a lot of potential to develop sea-based tourism. PSNews - The Buon Ma Thuot street carnival, part of the cultural activities to celebrate the 7th Buon Ma Thuot Coffee Festival, kicked off on March 9th. The representative office of the Korea Tourism Organisation (KTO) in Vietnam is implementing a campaign to promote spring tourism in the Republic of Korea. An annual cultural program called “Spring colors across Vietnam” has been recently organized in Vietnam’s National Village for Ethnic Culture and Tourism in Hanoi. The program honors Vietnam’s diverse ethnic cultures while contributing to unifying the country’s 54 ethnic groups. The first Mekong Delta Marathon Hau Giang 2019 will be organised on April 21 in Vi Thanh city in Hau Giang province, aiming to raise public awareness of climate change. Artists from Vietnam and the Republic of Korea (RoK) will join a dance show named “Colour of Dances” at the Saigon Opera House in Ho Chi Minh City on March 13. French gastronomy will come into the spotlight with the screenings of documentary and feature films by young French directors during a film month scheduled for March 12-27 in Hanoi. PSNews - The Lang Son Provincial Department of Cultural, Sports and Tourism has just commenced a new tourism information portal and tourist applications for smart mobile phones helping tourists find all information about Vietnam’s Northern province. All-male pop band Super Junior from the Republic of Korea (RoK) will perform in a RoK- Vietnam exchange concert in HCM City on March 29. 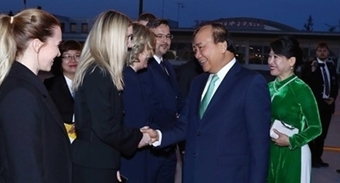 Female local and foreign visitors will be able to enjoy free admission to relic sites in Hue city from March 7-9 if they wear a traditional Vietnamese Ao Dai, according to Phan Ngoc Tho, Chairman of the Thua Thien Hue province People’s Committee. PSNews - Visiting Hanoi these days, tourists will have chance to admire Hoa Ban (Bauhinia Flowers), a type of flowers which look like soft and gentle clouds wrapping majestic mountains and hills from the northwestern region. The south central coastal province of Binh Thuan has optimised its potential and advantages to develop tourism sustainably, aiming to turn tourism into an economic spearhead in the time ahead. Vietnam’s newest carrier Bamboo Airways is carrying out its plan to conduct flights on 37-40 air routes in 2019 with the aim of expanding its network across Vietnam, according to General Director Dang Tat Thang. The Vietnam Culture Festival is to take place from March 6 to 10 at Thang Long Imperial Citadel in Hanoi. Vietnamese composer Trinh Cong Son (1939-2001) was commemorated with a doodle on google.com on February 28 on the occasion of his 80th birthday anniversary.